One of the best things about summer in New Paltz is that the produce is so fresh that little has to be done to turn fresh picked veggies into a meal. Take this simple tomato and basil salad, for example. 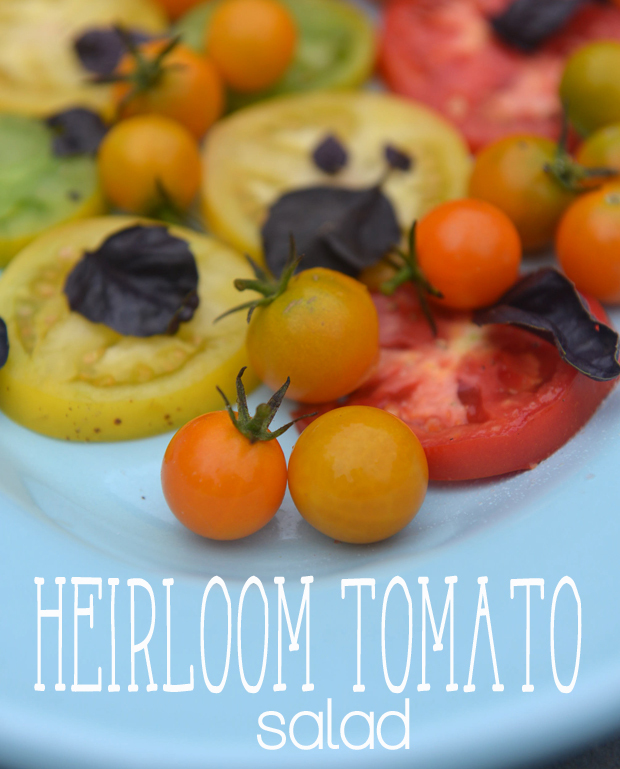 All you have to do is slice a few heirloom tomatoes and toss a handful of sungold gold tomatoes and fresh basil leaves on a plate. Sprinkle with salt and pepper and you’ve got the perfect BBQ side dish. We’ve been u-picking all summer at our local CSA. This week my mom and dad helped out, as Maya roamed around the farm fields and Amy watched from her ergobaby carrier. We took home bags full of sweet sungold tomatoes, green beans, and blackberries. The farm also grows several varieties of basil, like the purple basil we used for this salad.